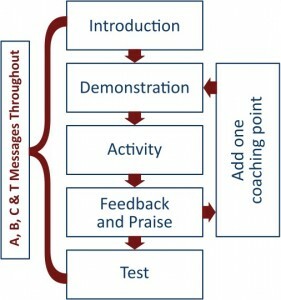 A short and clear explanation of what activity or skill will be being practiced in the coaching session. A practical example of the skill or activity, showing players what the skill should look like. Players have a go at doing the skill in an organised practice. Players should have lots of goes. The coach praises players when they are doing the skill correctly or when working hard. They also help players who are not doing the skill correctly to improve. To improve players the coach adds one coaching point at a time. To introduce the coaching point the group is stopped so that all players can see and hear. The explanation of the coaching point should be short and clear. TELL: When we give players instructions they should be clear and to the point. The group or player should be stood so they can hear easily. SHOW: When we demonstrate to players we should make sure they are arranged so they can see the important parts of the demonstration. We might want to show different sides of the skill, and demonstrate both with and without a ball. A test of the skill that the players have been practicing. This allows the players to know what their status is and see if they have improved. 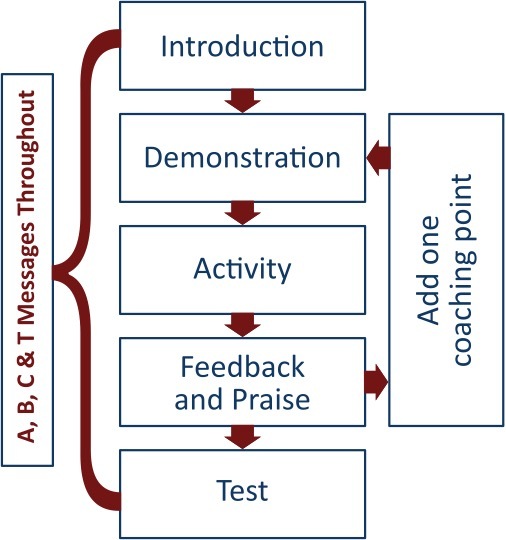 Ensure A, B, C & T messages throughout.